Elevate your next retreat to the High Country when you stay in this newly remodeled Banner Elk vacation rental home, nestled on 3 acres of peaceful countryside. Offering 3-bedrooms, 2.5 bathrooms and 1,800 square feet of tastefully decorated living space for 8 guests to enjoy. Call up your loved ones and escape to the splendor of the Blue Ridge Mountains! Step inside to serenity and tranquility, as this charming home is adorned with rustic details including knotty pine ceiling planks and river stones stacked from floor to ceiling, framing the gas fireplace. 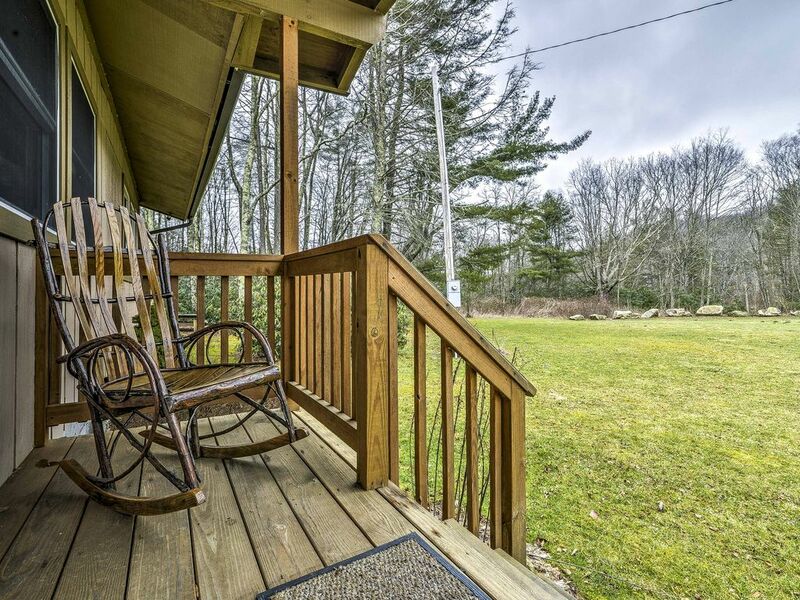 For the early risers, sip on an energizing brew of coffee while you rock in the finished rocking chairs on the front porch and marvel at the stunning views of the lush forestry that surrounds the home. Recline in the leather lounger and catch your favorite entertainment on the flat screen TV or flip through your latest magazine on the cozy sofa. Whip up a home-cooked meal in the fully equipped kitchen after a day of shredding the powder at the nearby Sugar Mountain or Beech Mountain. Retreat to one of the peaceful bedrooms after a memorable day, where you can slip into sweet dreams and rest up for tomorrows exciting day of activities. Whether you've packed your ski boots or hiking gear, you are in for a treat when you stay at this inviting Banner Elk home, ideally situated near endless outdoor activities and downtown attractions. Hit the slopes of Sugar Mountain (less than 3 miles away) for exhilarating skiing and snowboarding or hike the scenic hills of Grandfather Mountain for breathtaking views, only 25 miles from the home. Swing your troubles away at the pristine golf course of Mountain Glen or walk over to Tate-Evans Park and let the sweet melodies of musicians of the many music festivals fill your ears. Bring your fishing pole and cast off to catch dinner in the nearby river or pick apples at the local orchard. Stroll into town and sip on your favorite brews at Flat Top Brewery or enjoy scrumptious pancakes at the Banner Elk Cafe. Stop in for a juicy steak at Stonewalls or indulge in Cajun food at Louisiana Purchase. Peek in the unique shops in Blowing Rock or browse the trinkets at the Mast General Store in Valle Crucis. However you choose to spend your time while visiting this lovely Banner Elk vacation rental home, you are sure to make memories that will last a lifetime. Awesome location , Everything you need !!! Great mountain house in the perfect location !!! Everything you could possibly need was there upon arrival. We enjoyed the family room with it's vaulted ceiling and gas fireplace . We found the kitchen very well equipped to cook anything you might want , as well as having a gas grill on the back deck.The bedrooms were great for our party of six. We would definitely recommend this home to anyone looking to spend some time in the beautiful N.C. mountains. We love this place...never disappoints, always clean, beautiful view, has all the amenities, appliances, cookware needed; plenty of towels; hot fireplace; comfortable beds and furniture. Location is perfect..within walking distance to the park and the town and local brewery across the street. Great house! Would stay there again! Great house- has everything you need and in a great location! Loved being near the greenway to walk to the park! Great place to stay! Very clean and close to everything. We had a great time enjoying the nice weather on the deck. The house was clean and comfortable. Such wonderful hosts. The property was clean and well maintained and had everything we could need. Close to everything and we will be back. Thanks.